CinemaNext's mission is to provide you with fully-integrated solutions across the board for exhibition anywhere in Europe, from projection systems, audio systems, content management and central systems to cinema outfitting. Take advantage of the best of technologies for the ultimate movie-going experience. 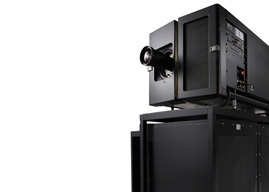 Thanks to our preferred partnerships with leading manufacturers, we guarantee attractive pricing for cinema projectors and best-in-class support.